Neverwinter has added many campaigns over the years as story lines and the game evolved. In fact, much of the content is either in a campaign zone or unlocked by finishing a campaign. While this has brought many unique zones and a wide selection of dungeons to Neverwinter, it also had its drawbacks. When a campaign is older, the rewards aren’t as interesting to endgame players who have kept up with the game. This also leads to campaign zones being trivial for well geared players but at times too hard for newer progressing players. With so much great content tied into these campaigns, we wanted to look at ways to improve the experience and make campaigns more balanced and more rewarding to all players involved. A campaign that is older and not a leveling zone is being moved into a grouping called Challenge Campaigns. These campaigns are scaled to offer a consistent challenge when adventuring in their zones. In addition, there will now be three weekly quests, available from Protector’s Enclave, which will direct you to these campaigns. The first week you might get a quest to complete Heroic Encounters in the Well of Dragons. Another to complete quests in the Dread Ring. And a third quest which has you kill enemies in Chult. Every player will receive the same quests on any given week allowing for you to group together with your friends and guildmates. But wait there’s more! On top of the normal rewards you will receive from those weekly quests, you will also get to choose a Bonus Campaign. Whichever bonus campaign you pick will grant you bonus currency to that campaign when you finish a quest. Example. You have the quest to complete Heroic Encounter in the Well of Dragons and have chosen Chult as your bonus campaign. 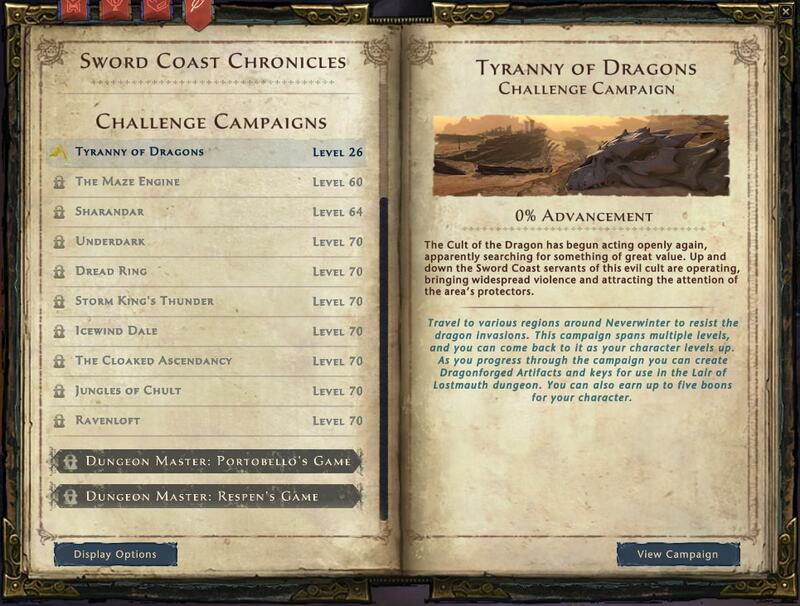 When you turn in the weekly quest you will receive Tyranny of Dragons campaign currency and Chult currency. You can change your bonus campaign choice at any time. We hope that everyone enjoys the new Challenge Campaign feature and make sure to stay tuned for more of the additions and changes going into our big Undermountain expansion.